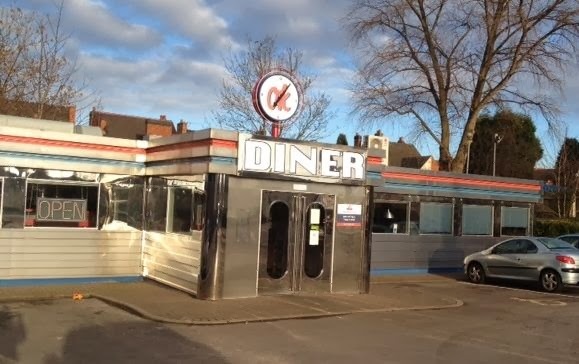 Spectre and I have often driven passed the OK Diner in Cannock, and talked about going in, but have never quite seemed to get the chance. I had the day off for my birthday, (feel free to tweet me happy returns) and so thought we’d try it out for a birthday lunch. 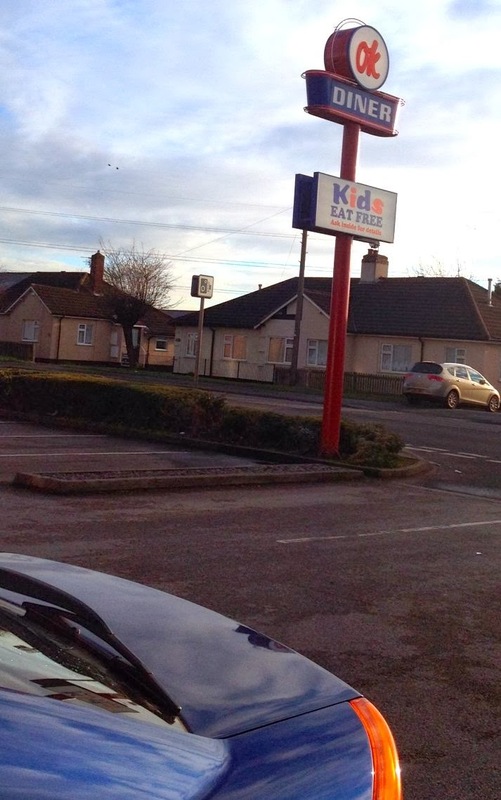 Ok Diners are a chain with eight branches across the UK. I absolutely love the look of the outside of the building, we don’t get this sort of thing usually in the UK, with its fab aluminium structure and tall sign in the car park. Even from the very outset it makes you feel like you are somewhere a bit special. It only gets better inside with the blue and red booths, and fabulous decor on the walls, the whole place may as well be singing The Star-Spangled Banner. In fact the music being played was all 1950s retro American rock n roll, which did add to the ambience nicely. We were seated quickly as we had chosen to go on a fairly quiet weekday lunch time, I suspect this is the kind of place that gets packed on a friday or saturday night. After a browse of the drinks menu, there was no question as to what I’d be ordering, the Million Dollar Shakes sounded amazing, and I was desperate to try the Peanut Butter Cup version. It wasn’t quite a million dollars but at £4.50 I still knew it was going to be good. What came was a large glass full of my milkshake and a top up jug with nearly as much again in it. 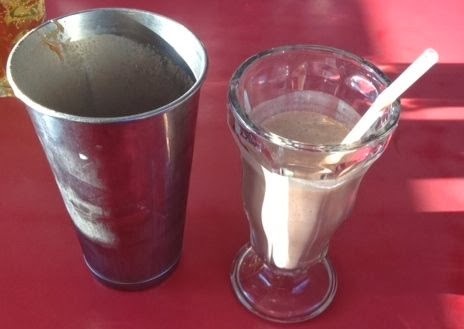 The shake consists of chocolate and caramel ice cream blended with peanut butter and chocolate drops. It was thick, rich, salty, chocolatey, sweet too and packing a heck of a peanut punch. Think liquidised Snickers bars, and me saying “oh my” every time I took a sip of the fabulous shake, it had the wow factor. Spectre on the other hand had a Budweiser. Ok he gains a point as it is american, but I’m not sure he was totally playing along with the theme. 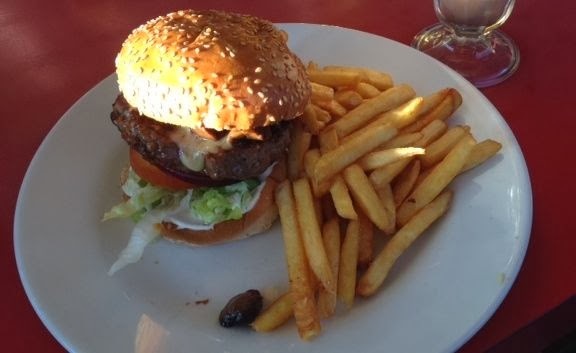 For mains I ordered a burger and fries, but had a helping of cheese and mushrooms on mine. Spectre went for the bacon and cheese burger and had for the larger sized burger too, perhaps he was staying with the theme after all! When they arrived we were impressed by the amount of food, and the generous helping of chips, excuse me, french fries. They were cooked perfectly fluffy on the inside but with a lovely golden colour and light crispiness to the texture on the outside. I was dipping mine in the French’s mustard provided on the table, yum! Both burgers were cooked freshly, and really tasty and meaty. 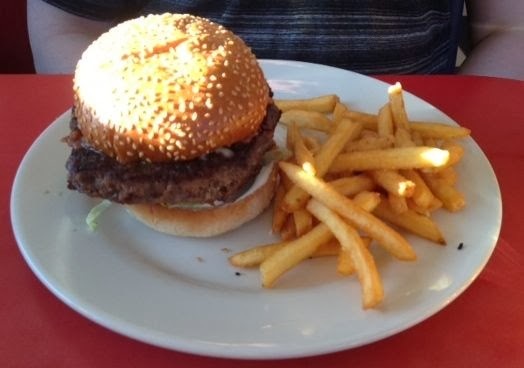 My burger was big, and Spectre's burger was larger still! The salad on them was crispy and fresh, and there was a nice crunch from the onion. The bread was fluffy and sesame seed topped, giving it an authentic feel. My burger was loaded with cheesy mushroom and it did make it just a bit more indulgent! Spectre loved the bacon on his too, and we both cleared our plates completely. After the meal I finished off the rest of my shake and sadly didn’t have room for dessert, which is a shame as I had my eye on the pancakes on the menu. Guess we’ll have to go back to give those a try, and frankly I can’t wait till we do! It is a fabulous themed restaurant serving quality food with a friendly service, whats not to love. Two mains and two drinks cost £26. 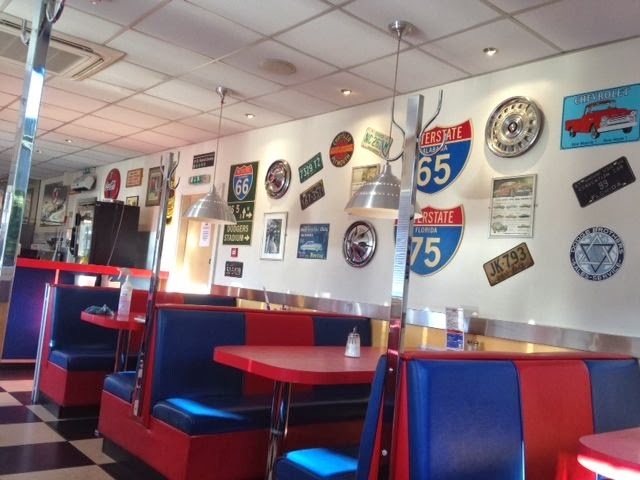 The OK Diner is awesome and the staff at Cannock are so nice! Thank you, I'd never heard of this chain before! I'll definitely be checking out the one in Leominster at some point. I LOVE the OK Diner! I first went there after driving past it several times and wondering whether the food was really that mediocre that they had to call themselves that.